David B. Lowe was born in Brooklyn, New York in 1915. His father, Max, was a police lieutenant, and David attended Jamaica High School, where he excelled in sports. He later attended Long Island University and played varsity baseball. Following graduation, Lowe was an athletic director with the Queens Park Department and played baseball in the Queens Alliance. He entered military service as an aviation cadet in December 1941. His younger brother, Gordon, who had starred at Jamaica High School in baseball, basketball and track, and, at the time, was a junior at City College, entered military service as an aviation cadet the following month. David earned a commission as a bomber navigator and was assigned to the 400th Bomb Squadron of the 90th Bomb Group in the Pacific. In the early morning hours of December 18, 1942, Second Lieutenant David Lowe was the navigator aboard a brand new Consolidated B-24D Liberator waiting for take-off on the runway at Amberley Airfield, near Ipswich in Queensland, Australia. Piloting the four-engined bomber, which had been nicknamed "Texas Terror", was the Operations Officer of the 400th Squadron, Captain James E. Gumaer, Jr. The B-24 was bound for Iron Range Airbase in Queensland. It landed at Garbutt Field, near Townsville to pick-up more passengers and left Garbutt at 08:15 bound for Iron Range. Included among the total of 20 personnel on board was an officer carrying four months' pay for the Iron Range gunners. Shortly after take-off, the plane ran into severe bad weather. All contact was lost and it was reported as missing. By May 1943, there was still no news of the fate of the B-24 and David's younger brother, Gordon - who had also graduated as a navigator - left the United States to serve with a bomb group in North Africa. Two months later, Gordon was killed in action during a raid over Sicily. It was not until January 7, 1944, that a search party found the wreckage of David Lowe's B-24 in Australia. It had crashed into the southern side of Mount Straloch on Hinchinbrook Island, killing all onboard. The remains of the 20 airmen were removed and interned in Ipswich Cemetery. They were later exhumed and permanently buried on January 7, 1949 at Fort McPherson National Cemetery in Maxwell, Nebraska. The payroll carried onboard was never found. In November 1960, a six-foot cross, made from aircraft aluminum, was erected at the center of the wreckage. 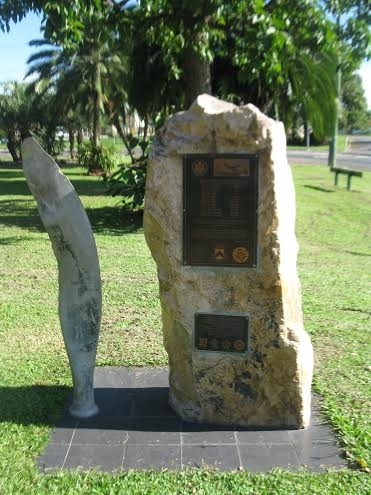 During 1999, a stone memorial with a propeller blade recovered from the crash site was erected at the town of Ingham in Queensland.